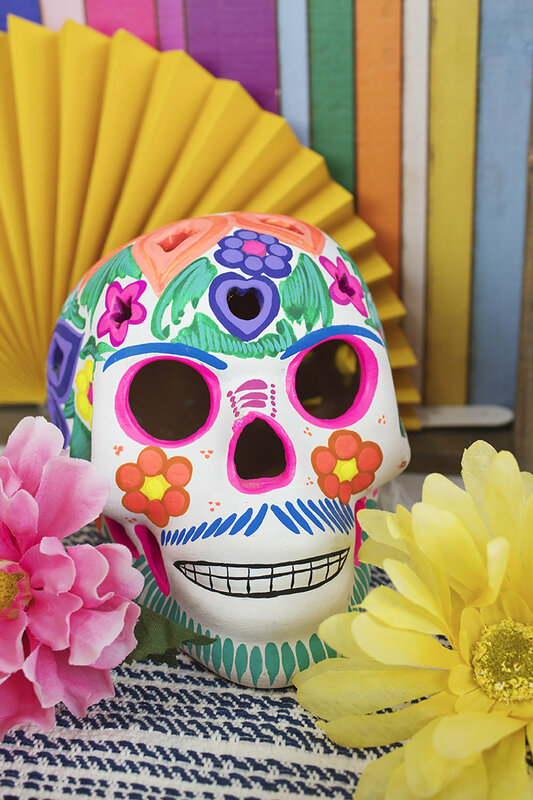 Looking for a way to celebrate Cinco de Mayo, Mother’s Day, or celebrate a mom-to-be? Look no further! 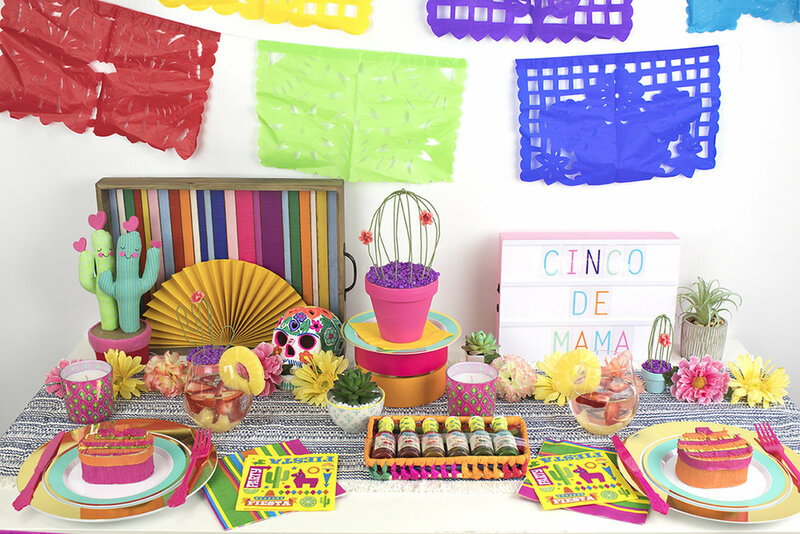 This Cinco de Mama Party is a Mexican fiesta without the alcohol. It’s all about food, decor, and crafts! As a pregnant woman, being awkwardly excluded from holidays where everyone around you gets drunk is kinda weird. I know Cinco de Mayo may not be a drinking holiday in every country, but in the USA it’s a celebration of Mexican culture, food, and drinks. As a holiday lover, I hate to pass on any opportunity to celebrate. So, I made my own party that celebrates moms-to-be. This party can really easily be converted into a birthday party, baby shower, or even a regular ol’ alcoholic party if you wanted to. The choice is yours! Since I’m a little tight on cash these days (ya know... saving for a baby) I decided to keep it simple by using all supplies I had at home. That’s right- I only bought two things for this blog post! The papel picado banners from Amazon and the serape wooden tray from Michaels. Well, 3 if you count a box of churros that never made it into the setup but I’ll eat those later- don’t you worry! I kept the table extra laid-back and skipped a tablecloth. Instead, I put a table runner down, which had a little fringe- so fun! 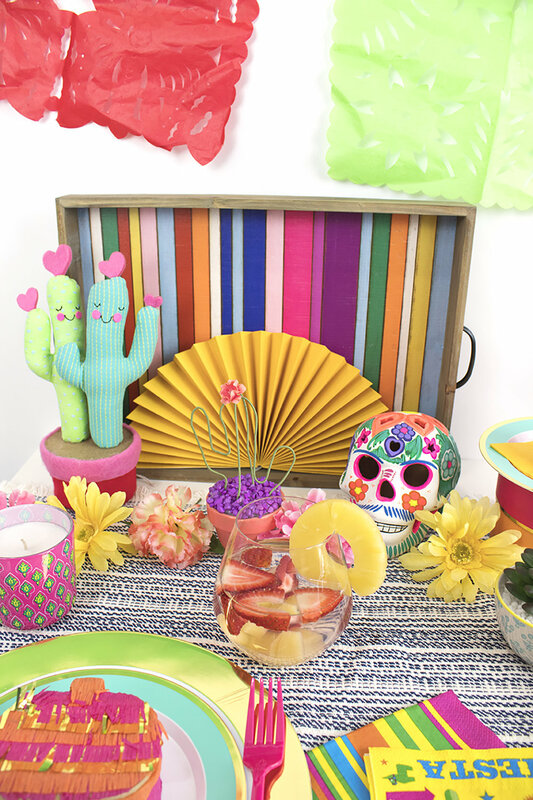 I added papel picado along the edge of the table and as the backdrop, plus added some paper fans I had saved from a Cinco de Mayo party years ago. Hoarding has it’s good points too sometimes! For my tableware, I used some gold plastic plates I had left over from Thanksgiving topped with an aqua blue plate. Each place setting was topped with a mini piñata filled with candy plus a bright pink fork and knife. 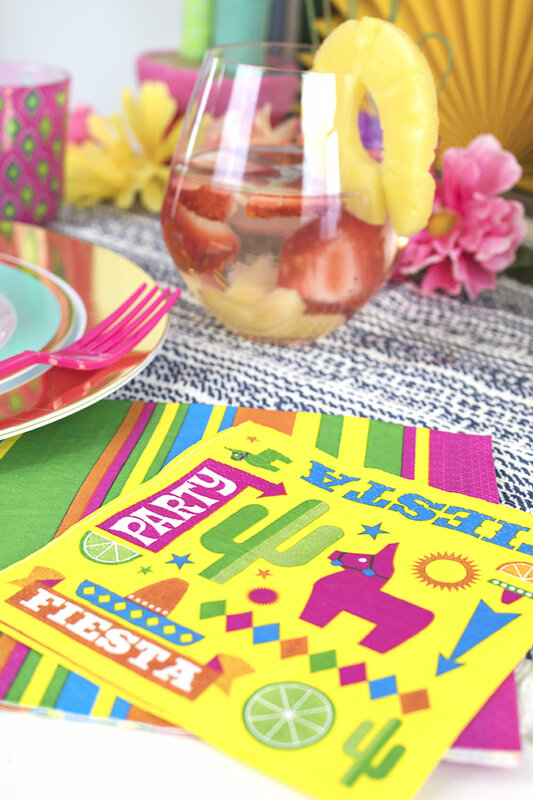 I foresee lots of eating at this party, so each person got 2 napkins, a cute striped one and a fiesta one filled with piñatas, limes, and cacti. Speaking of cacti... I put them everywhere! 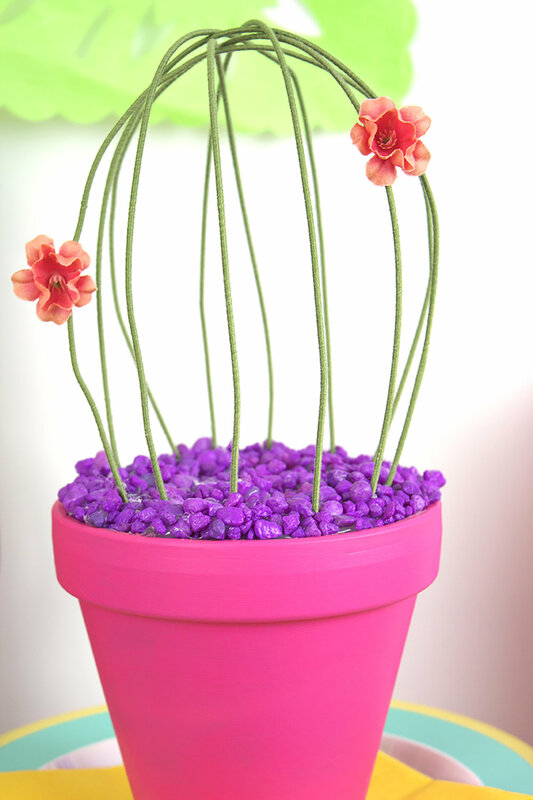 I have some wire cactus plants that I made along with succulents from around my house (fake as well, because I kill everything) and a cute felt cactus. For decor, I added my fancy new tray from Michaels (half off! ), my marquee light, and some colorful candles. I had to grab my painted skull I got in Mexico, and I added some fake flowers left over from my flower gift box to add a delicate romantic touch to the table. Overall, I’m in LOVE with this setup. Now, let’s talk about food. I’d serve this chicken taco recipe for a crowd because it’s so easy to make and so so SO good! I’ve made it for parties and everyone loves it. Then, add some mexican street corn dip on the side. Mexican street corn is my absolute favorite thing and I’m practically drooling just thinking about it right now. Then, add some easy chips and dip, homemade guac, and churros for dessert. For drinks, I recommend your favorite mocktail or some infused water or sparking water for a healthier choice! I went with strawberries and pineapples for my water. Delish! And there you have it! A simple Mother’s Day/ Cinco de Mayo party for the women you love. 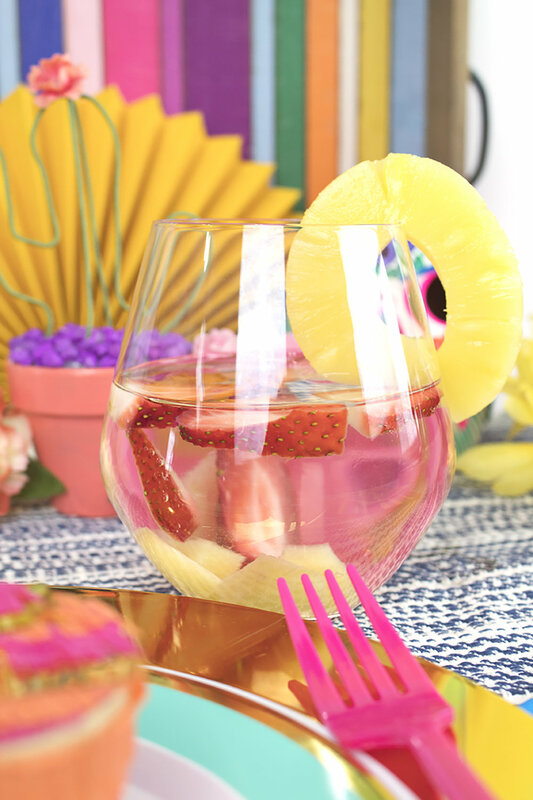 What would you serve at your Cinco de Mama party? Let me know in the comments below!